Thor is a strikingly handsome BIG un-tattooed black male. Dr. Ellis approximates his age to be about 2 years old. 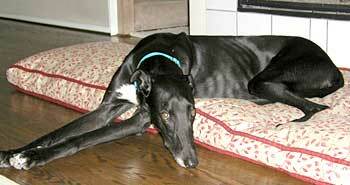 He, like so many of GALTs greyhounds, was found as a stray. 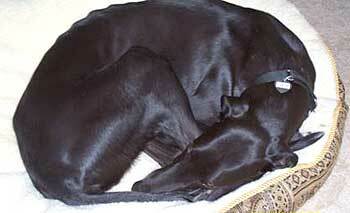 Thor has received successful treatment for Ehrlichia, a tick-borne disease. 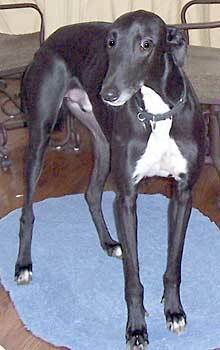 His Ehrlichia titers indicated he was in the chronic acute stage and he was asymptomatic. His titers dramatically decreased, and his CBC shows rapid improvement. 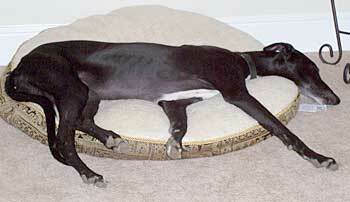 Thor will need to be monitored annually for the rest of his life to insure the Ehrlichia titers stay low. Thor is a gentle giant and is very, very affectionate. He is not cat tolerant. Thor is a beautiful big boy. He has the most precious soulful eyes that will look at you, trying to figure out what you are thinking. He has that pretty white area on his chest, like a white bib on a black shiny coat. His ears are so soft. Thor is a very sweet dog, a big baby. For some reason, he really likes to sit. Maybe that is because it puts him at a perfect level for head scratching? He loves attention, even more than he loves his food. When fed immediately after coming home from work, he won't eat as that takes away time from the family. He "talks" to us. When he talks, we imagine he says "I miss you when you are gone and now I want to be loved on and held. I'll eat later." After a while, he will talk some more and let us know "Hey, I am ready for food now!" Despite his size, he eats with care, and usually leaves a snack for later. Thor is a smart boy. He quickly figured out that the talking is considered cute and renders rewards like the much sought after attention. The talking serves multiple purposes, as he also uses it tell us when he needs to go outside. Considering his height, he is a natural at counter surfing. As the counters are right at eye level, we keep temptations away from him. It is hard to look at something really tasty just laying there right in front of you, when you cannot have it... So, Thor needs somebody to be considerate of that, and put away those temptations! In other words, if it isn't for Thor, please clear it off the counter. That's what we call playing fair. He is as sweet as they come, and despite his size, very mild. He has no problem being touched on his ears, his mouth or his feet. He has not been around children much, and when he is, he is not quite sure what to make of it. What are they, those small humans? Although gentle, his size does generate a word of caution around children, because he could easily knock a child over by accident. Mutual respect is recommended. Thor will require a strong hand for walks. We have found that the best way to distribute his strength and weight is to use a harness. It just makes it easier on all of us. Another very good reason to keep Thor on a harness is his strong interest in bunnies and small animals in general. He knows how to slip his collar and will do so if something interesting comes along. Once he has seen a rabbit, he won't forget about it, and he keeps wanting to go back to where he saw it last. Another great way to make walking easier is to use a so-called "Gentle Leader". GALT can help pick one out. Bottom line, any dog the size of Thor needs the appropriate tools and strength when walked. As Thor is young, he is still learning. Being such a people pleaser he would probably do great in an obedience class. Thor wants you to be happy and when you are not, he just lies down and looks sad too. Thor, just like any other dog, will test his boundaries, but when told no, and faced with consistency of this "no", he happily complies. Once he has learned the house rules, he is happy to follow them. Aware of his boundaries, he is now the wonderful boy that we love and cherish. 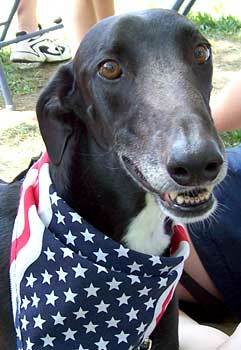 Just the sight of this Greyhound is an attention grabber wherever he goes. He is grand! If you visit any GALT event where Thor is present, you will know who he is. He has stature and poise. At first, he might be a bit intimidating due to his size, but in minutes, oh how you melt when you look into those eyes and learn what a sweet, sweet boy he is. Come meet Thor, the gentle giant.